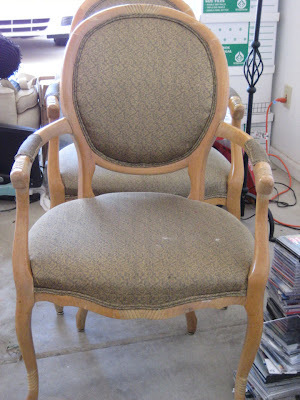 I bought a couple of $29.00 Queen Anne arm chairs last year to redo and use in my home office. I also about that time I bought a disgusting looking wingback chair at a garage sale for $10.00 to use as my desk chair. The wingback had to be rebuilt completely because it sat way too low for this short lady to use as a desk chair. I finally had these three chairs redone and I wanted to share the finished chairs. I like them so much that I may use them as the end arm chairs in my dining room. Here is the before shot of these sad and tired chairs. 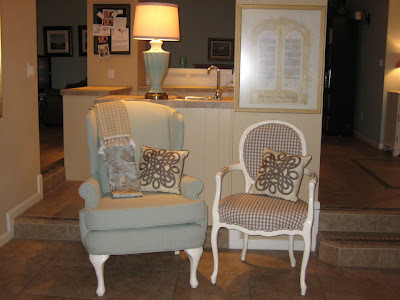 Here's a picture of the chairs made over. I love the clean, fresh, and classic look of the redone beauties. In this picture are also two sets of bargain draperies I designed and had made. 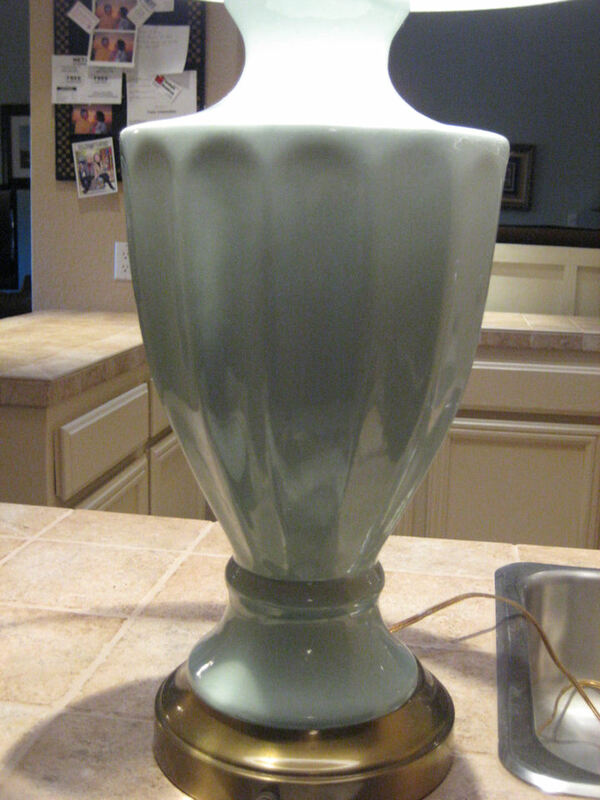 The lamp in the picture is one of two $5.00 lamps that I bought that is the perfect match. 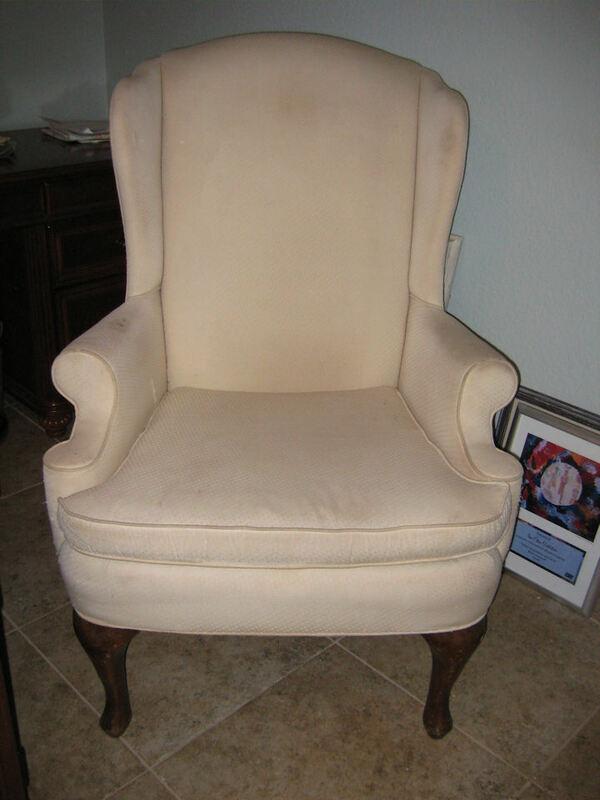 Here is a closeup of the arm chair. I threw a couple of my bargain throw pillows on the chairs just for the picture. I think the pillows look kind of good, don't you think? Just in case you are interested, I'll include a picture of my drapes and $5.00 lamps. I'll post at length about the drapes in another post. Aren't those lamps the perfect color? I just love the color. I have some inexpensive drum shades on them now, but since I paid so little for the lamps I may splurge and have a custom shade made that will be just perfect. So what do you think of my formerly sad chairs now? I love them! So next time you see a chair that you think is beyond repair, instead of just walking by think of the possibilities instead. 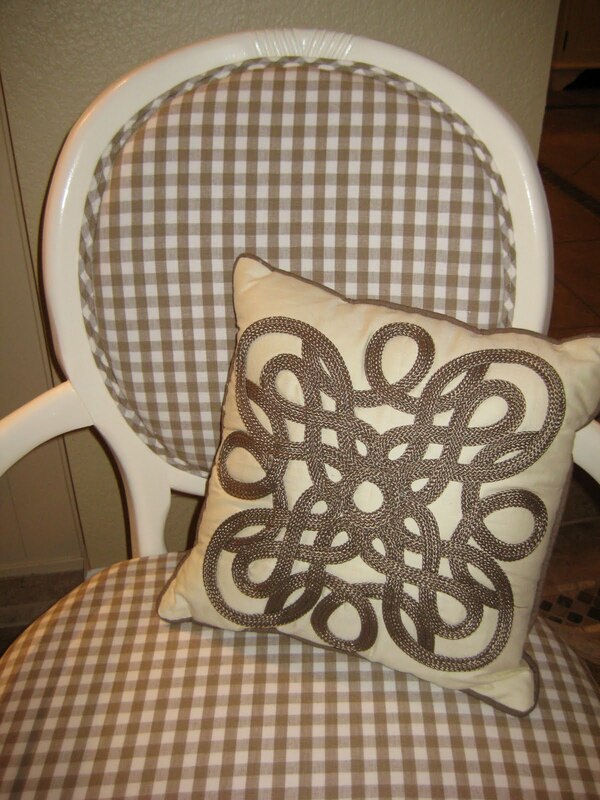 Love the fabric you chose for the Queen Anne chair! The pillow does look great on it. 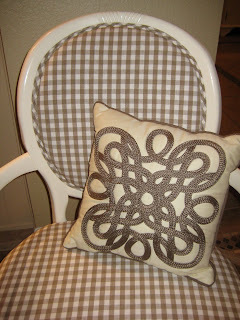 I think the mix of patterns works wonderfully and the texture the pillow supplies is a plus. I'm eager to see your drapes up! 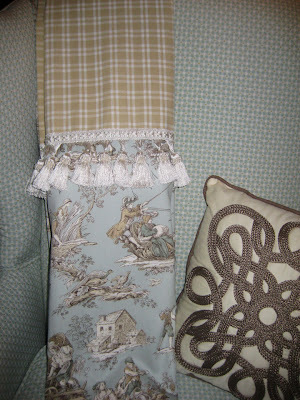 I love that toile I'm seeing. I was going to ask you where you got them but re-read that you designed and had them made. The lamps look great, too. very nice!! I LOVE all those colors!! Dont you just love it when you find a deal!!! those chairs are gorgeous! LOVE the fabric and colors. Marvelous job!!! lovely! thanks so much for sharing on Craft Schooling Sunday!